Armour Square is a Chicago neighborhood on the city's South Side, as well as a larger, officially defined community area which also includes Chinatown and the CHA Wentworth Gardens housing project. 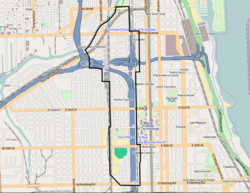 Armour Square is bordered by Bridgeport to the west and Bronzeville to the east, with Pilsen and the near South Side bordering the area to the north and Fuller Park bordering its southernmost boundary along Pershing Road. Bounded by 18th Street to the north, Pershing Road to the south, the Union Pacific railroad tracks on the west and the Dan Ryan Expressway to the east, Armour Square has historically been a predominantly white, working-class neighborhood with a particularly significant population of both Italian-Americans and Croatian-Americans. With its location being immediately south of Chinatown, today the neighborhood also has a large Asian population as well. Armour Square's most recognizable landmarks are the historic Armour Square Park and nearby Guaranteed Rate Field, which sits at the southeast corner of W.35th and Shields Avenue, on the neighborhood's southernmost end. Guaranteed Rate is home to the Major League Baseball franchise, the Chicago White Sox. There are three Catholic parishes in Armour Square: Santa Lucia, St. Therese Catholic Community at 218 W Alexander St., and St. Jerome Croatian Catholic Church. The southernmost census tract in the area (3406) is 99% black or African American. Historical images of Armour Square can be found in Explore Chicago Collections, a digital repository made available by Chicago Collections archives, libraries and other cultural institutions in the city. In 1900, Charles Comiskey moved his St. Paul Saints to Chicago, where they became the team now known as the Chicago White Sox. They began play at the South Side Park on 39th Street in Armour Square, and have remained in the neighborhood ever since. No other major professional sports franchise has played in the same neighborhood longer than the White Sox. In 1910, Comiskey Park opened just 4 blocks north of South Side Park on a site that was formerly a junkyard. The Park remained the home of the Sox until 1990, when it was the oldest park in Major League Baseball. The new Comiskey Park, currently known as Guaranteed Rate Field, opened in 1991 across 35th Street from the old ballpark. Comiskey Park was then demolished in 1991 and converted into a parking lot. A plaque embedded in the asphalt marks the spot where home plate was on the original field. The Chinatown Gate in Chinatown, Chicago, Illinois. 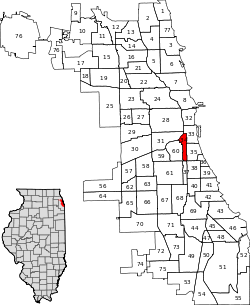 Chinatown is in the near South Side (located in the Armour Square community area), centered on and around Cermak and Wentworth Avenues, and is an example of an American Chinatown, or ethnic-Chinese neighborhood. It is not to be confused with an area sometimes called "New Chinatown", which is on the North Side around Argyle Street, and which has a larger number of Southeast Asians. Armour Square is served by the Dan Ryan branch of the Chicago Transit Authority's Red Line, with stops at Cermak-Chinatown and Sox-35th. It is also served by Metra's Rock Island Line via the 35th Street station. ↑ Biasco, Paul. "Logan Square Hispanics Vanishing As Neighborhood Becomes More White". Retrieved 21 June 2016. ↑ Paral, Rob. "Chicago Census Data". Retrieved 9 October 2012. ↑ "American Fact Finder". United States Census Bureau. Archived from the original on 2013-09-11. Retrieved 2012-11-25. ↑ Long, Elizabeth. "A Single Portal to Chicago's History". The University of Chicago News. Retrieved 17 September 2016. ↑ Bova, George. "Sox Fan's Guide to Sox Uniforms". White Sox Interactive. Retrieved 14 April 2013. ↑ "Beginnings". White Sox Interactive. Retrieved 14 April 2013. ↑ "Reinsdorf: Rebirth And Death". White Sox Interactive. Retrieved 14 April 2013. ↑ "Progress? New Comiskey Park". White Sox Interactive. Retrieved 14 April 2013. ↑ "The Parking Lot". White Sox Interactive. Retrieved 14 April 2013. ↑ Paral, Rob. "Chicago Community Areas Historical Data". Chicago Community Areas Historical Data. Retrieved 29 August 2012.